Indiana State University student Samantha Norton recently mentioned that airports and airlines can help students learn if they were directly involved in their education. She didn't tell this to other students, but to a crowd that included members of the airline industry themselves. Indiana State hosted the 2011 University Aviation Association national conference at the Hyatt Regency hotel in downtown Indianapolis. About 300 members of the aviation group, along with vendors and members of companies working in the airline industry attended the three-day conference. The gathering included exhibitions, industry tours and presentations on topics ranging from the use of social media among collegiate aviation faculty members to unmanned aerial systems. "For us to be able to host was really an incredible event," said Harry Minniear, chair of the aviation technology department in ISU's College of Technology. "This is something that gives the university and our aviation program national recognition and visibility." Aviation technology students and faculty members from ISU volunteered to work the event, and some students also attended the panel discussions and presentations. During one of the discussions, Norton, an aviation management major from Marshall, Ill., gave her suggestion in response to a group that was placing responsibility of learning on the students. After the discussion, a commercial airline pilot spoke with Norton to inform her of internship opportunities available with the company. "I thought that the discussion we had was pretty interesting," Norton said, "I have enjoyed making contacts here and meeting some people in the aviation industry." Some faculty members were involved in the conference in other ways. Richard Baker, assistant professor in the aviation technology department, represented ISU on a three-member panel discussion about unmanned aerial systems. Baker, along with John B. Bridewell of the University of North Dakota and Kyle Snyder of Middle Tennessee State University, discussed their institutions' approach to developing their programs. Only five universities in the country have established unmanned aerial systems programs, said Baker, who was pleased with the more than 30 people who attended the presentation. Some people wanted more information about the topic, he added. "It was well received," Baker said of the presentation." We had a lot of people come up after the presentation was over and had individual questions, and we received some feedback about the fact that they would like to see a workshop next year on this topic." ISU student Christian Reid was among those who learned more about unmanned systems. Reid, a senior aviation management major from Greenfield, also volunteered to work the conference. While there, he also learned more about some of the jobs in the aviation industry, which he first learned more about in his studies at Indiana State. "I hope to be a professional pilot all my life," Reid said. "But, at the same time, when you get into an airline or a corporate company, your degree in management would allow you to have other jobs in the field." Indiana State garnered the right to host the conference through a competitive selection process. ISU submitted a proposal and learned two years ago that the university would host the conference. "As it goes, we're not one of the larger aviation programs out there," Minniear said. "We're considered to be fairly small, and for us to go head-to-head with a lot of the big universities and be awarded this conference was something very special for us." The conference also included an awards banquet, where Troy Allen, associate professor of aviation technology and assistant dean in the College of Graduate and Professional Studies at ISU, received the Frank E. Sorenson Award from the UAA. The Sorenson Award recognizes a UAA member who has made significant contributions to research and scholarship in aviation, the organization's website states. "I was very happy to bring recognition to the university that I care deeply about, and I am honored to receive the award," said Allen, who added that UAA President Kurt Barnhart nominated him. Melanie Abel, an aviation instructor at ISU, also volunteered to work the conference. She spoke with other conference attendees, including the manufacturer of one of ISU's flight simulators. "There were quite a few airlines, lot of different universities that have aviation programs and a lot of aircraft companies as well," Abel said, "so it was really neat to see everybody come together here in Indianapolis." 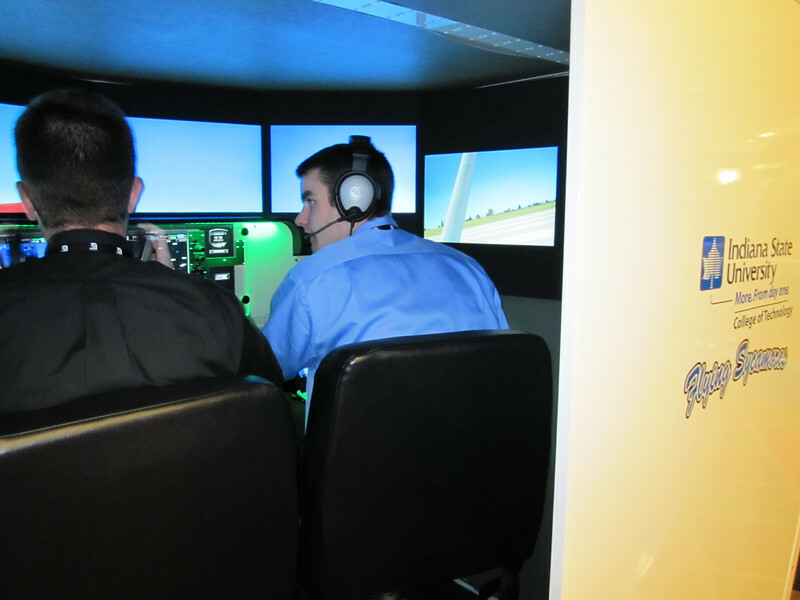 Indiana State University student Christian Reid, right, instructs a fellow student during a flight in ISU's flight simulator at the University Aviation Association annual conference in Indianapolis. ISU hosted the conference, which included about 300 attendees from across the country. Contact: Harry Minniear, chair, aviation technology department, College of Technology, Indiana State University, 812-237-2641 or harry.minniear@indstate.edu. Indiana State hosted the 2011 University Aviation Association national conference at the Hyatt Regency hotel in downtown Indianapolis. About 300 members of the aviation group, vendors and others in the aviation industry attended the conference.